Live Colorado: Grab your grandmother or your sweetheart. Hold hands and glide on some ice. From lakes to the airport, Colorado offers great skating options. ‘Tis the season to put on a hat and mittens and grab some ice skates. Colorado offers wonderful places outdoors to skate from mountain lakes to town centers and even the airport. Photo: Getty Images. What better way to enjoy the holidays than finding a beautiful spot outside to glide and twirl, or if you’re just learning, to shuffle and giggle a bit? Even if you’re not a pro, plenty of fun awaits you. Chances are you can find a pick-up broom hockey game or a young figure skater practicing jumps to inspire you. Grab your grandmother or your sweetheart. Hold hands or the side of the rink for support. Then enjoy taking a few spins as pine-scented breezes turn your cheeks red. Grab your sweetheart. Hold hands and take a spin on some ice. This couple is enjoying the Parker Ice Trail. Photo courtesy of Jim Ott, Town of Parker. Afterwards, get Zen as you sip a cup of hot cocoa and watch the mesmerizing Zamboni transform rutted ice into a perfectly smooth surface for the next session. Both skating and the peace of watching others on the ice are great for the mind and body. Here are some of our recommendations for the top outdoor ice-skating spots in Colorado. You’ll love the world’s largest Zamboni-groomed outdoor ice rink. It’s spacious: 8.5 acres with several sections for hockey games and calmer areas for kids and other recreational skaters. Evergreen is busy and fun with skate rentals and other equipment available at the beautiful Evergreen Lake House. Depending on the temperatures, Evergreen Lake is slated to open on December 15. You can always call the skating hotline at 720-880-1391 for up-to-the-minute conditions. 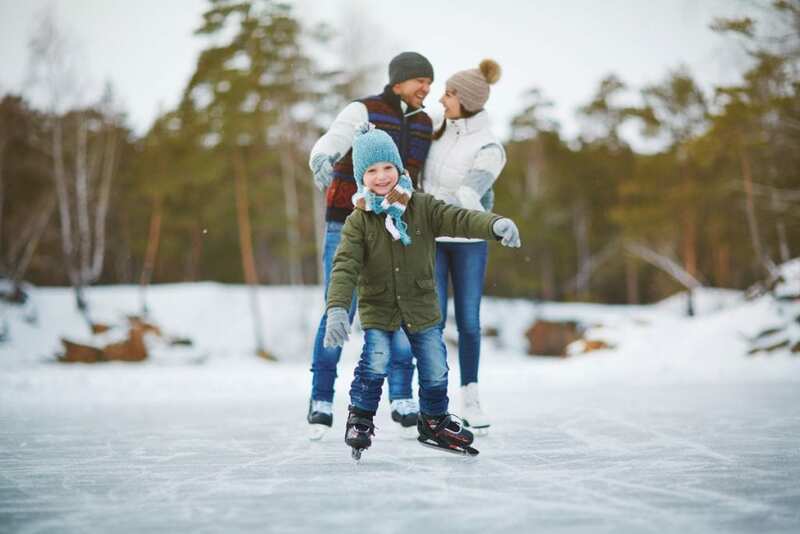 And if you’re looking for a fun family celebration for New Year’s Eve, check out the Skate the Lake party and fireworks at Evergreen Lake. Click here to learn more. This pond is in a lovely location bordering Rocky Mountain National Park. The ice typically freezes in mid-December and stays safe through mid-February. For guests staying at the YMCA, there’s no charge for skating or skate rentals. Others can purchase day memberships to skate on the pond and participate in other activities at the Y. Call to check on conditions: 970-586-3341, ext. 1104. Keystone is another lake that gets the Zamboni treatment. So you can expect a nice, smooth surface on this 5-acre pond. 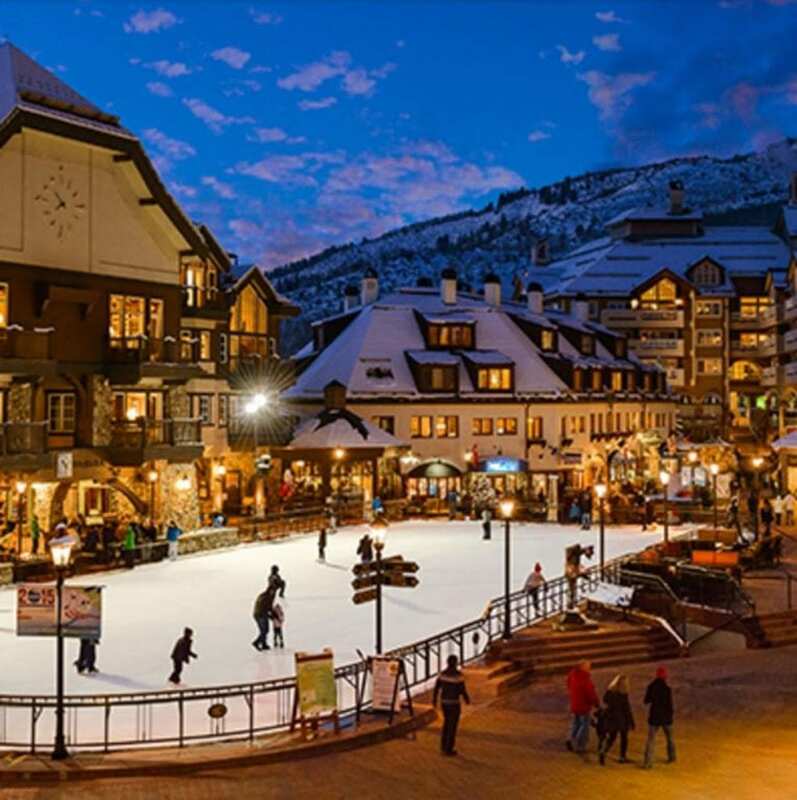 Plus, you get beautiful views of the mountains and ski slopes around you and there are plenty of restaurants encircling the lake for après-skate fare. Keystone Lake boasts separate hockey and recreational areas and you can even rent hockey sticks and pucks to go with your skates. For updated skating information, call 970-496-4386. 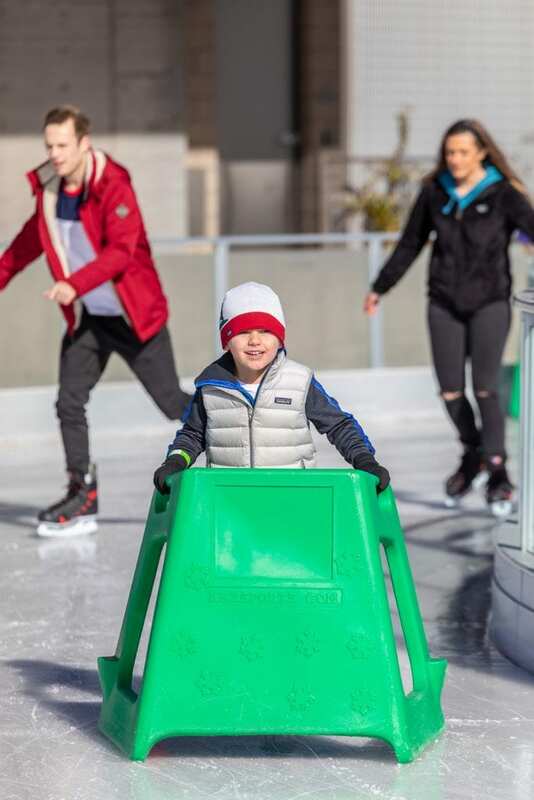 Learning to skate is easy and fun at the Parker Ice Trail at Discovery Park. Photo courtesy of Jim Ott, Town of Parker. What, you might ask, is an ice trail? Imagine skating on a frozen canal in Amsterdam. No, Colorado doesn’t have canals that freeze. But the town of Parker drew inspiration from frozen rivers and canals and instead of creating an ice rink, Parker’s recreation gurus thought outside of the box, or outside of the rink in this case. They have created one of the only ice trails in the U.S. The new (enjoying its third season) Parker Ice Trail is a 20-to-25-foot wide ice path that meanders for 450 feet through Discovery Park, reminiscent of a frozen river or canal. The Ice Trail is open every day in the winter. Staffers are always on the trail to help teach little ones to glide and to tighten up laces when necessary. And there are fire pits along the trail where skaters can warm up by the fire with a cup of hot chocolate. Skating in downtown Colorado Springs’ Acacia Park is a lovely way to enjoy time on the ice throughout the holidays. Now you can score a $1 discount if you show up in an ugly sweater or a fun hat on Friday, Jan. 4 from 5 to 7 p.m. when UCHealth gets in on the act. UCHealth community ER pros at Meadowgrass, Fountain, Powers and Woodmen have joined together to host this skating event and will be giving away UCHealth beanies. If you’re looking for an old-fashioned experience on the ice and plenty of pick-up hockey games, Longmont’s Ice Pavilion is a great choice. The Fraser Valley in Grand County has long been dubbed the “icebox of the nation.” So, where better to have an NHL-sized, partially enclosed naturally frozen rink? The skating rink is located in a 40-acre park just outside of the town of Fraser in the Fraser Valley Sports Complex. The rink is known as The IceBox and it offers plenty of open skating along with hockey games throughout the winter. Frisco’s Meadow Creek Pond is a low-key, free affair located behind Walmart. The pond is open from dawn until 10 p.m. Skaters must bring their own equipment. The skyscrapers will surround you as you take laps on this small rink in the middle of downtown Denver. Each day brings different activities. Skating is free. Rentals are available for a fee and if you’re lucky, carolers will serenade you as you enjoy a loop or two. Beaver Creek boasts a beautiful outdoor skating spot in the heart of its village. You can enjoy a day on the slopes, then an evening gliding around the rink. Photo courtesy: Beaver Creek. Talk about idyllic. You can enjoy a day on the ski slopes. Then you can stroll to this lovely outdoor skating venue in the middle of Beaver Creek’s European-style village. It’s especially fun to skate when big, fat snowflakes are falling all around you. But, here’s a fun fact. Beaver Creek offers a rare chance to ice skate outdoors in the summer. Check it out during any season. Old Town in Fort Collins sparkles during the holidays with a skating rink. Photo courtesy: City of Fort Collins. 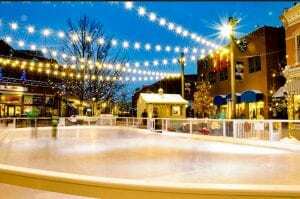 The skating rink in Fort Collins’ Old Town is not only charming. It’s a bargain too: $2 to skate and $1 to rent skates. The lovely outdoor venue is open Fridays through Sundays with extended holiday hours. Imagine a Courier and Ives winter print showing the most beautiful aspects of winter. You’ll see that image spring to life. 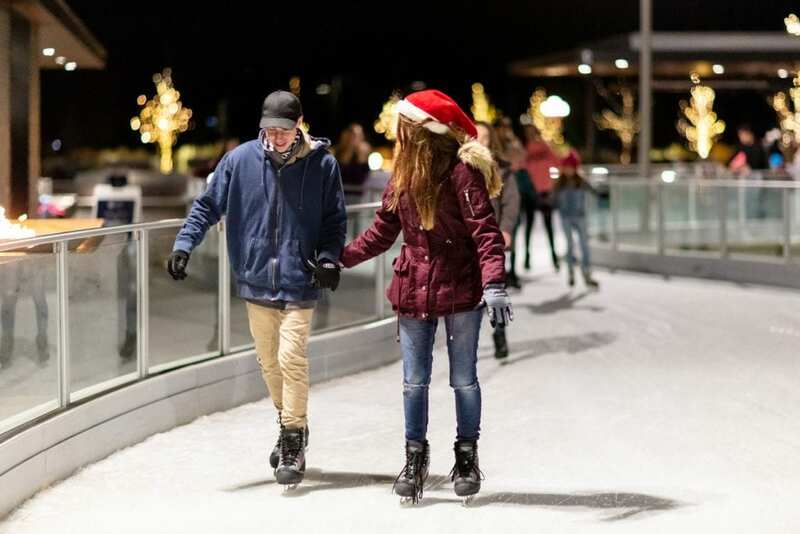 Now in its 15th season, Louisville’s WinterSkate features traditional holiday music, free horse-drawn carriage rides, free parking, a warming hut and a 6,500 square foot rink. An airport? For ice skating? Yes. Remarkably, Denver International Airport boasts a skating venue for travelers who need to move a bit between flights or those who want to arrive early or stay after their flight has landed to take a few spins around the DIA rink. The ice is located in an outdoor plaza next to the Westin Hotel. The price here is fabulous: both skating and rentals are free. There’s even free hot chocolate on Fridays starting at 11:30 a.m. until it runs out. And, if you’re up for an adventure, anyone is free to enjoy the rink. For those making the trip just to skate, short-term parking is available for $4 or you can take the A-Line from Union Station, which charges $9 for a day pass. Bonus: visitors to the rink do not need to pass through security to enjoy it. Enjoy!